Wilma and Liane are a mother-daughter duo and new neighbors in our community! We welcome them as they take root and branch out in our agrihood. They go into depth with why gardening plays an important role in their family. As Wilma says, “Food is love,” and we couldn’t agree more. Wilma and Liane outside the greenhouses. Wilma: Digging in soil feeds my agricultural soul. I grew up immersed in California’s San Joaquin Valley with a plum orchard nearby and views of Mt Whitney in the distance. The family across the street had a chicken farm – I’d get to visit the gigantic coops when a new batch of chicks arrived. There was always something growing in the family garden…my dad grew amazing tomatoes. I recall sliced tomatoes as a delicious summer treat with pan-fried fresh salmon he’d caught the previous day. Also fall persimmons and pomegranates; hand-shelled walnuts, endless tangerines during foggy winters. Nectarines are my favorite summer stone fruit. My mother tended the gardens, had us deliver surplus to neighbors, grew flowers and was a fabulous cook. She was key to our tight-knit neighborhood. Liane: I like gardening a lot because I’m growing something with my hands and I get to make sure a plant is nice and secure in the ground and tend to it. 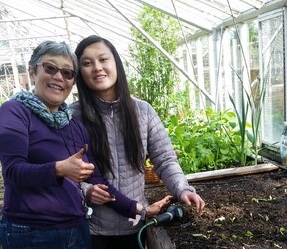 What types of mother-daughter activities do you all do when you garden? Liane: We usually do plant shopping, and sometimes I help with weeding and potting. Back at home, I love picking and eating raspberries! I mean I just water the back yard area, and I planted beets and some other things too. Wilma: I like to give packets of seed as gifts, especially during winter holidays— it give us something to look forward to. The miracle of a seed captivates my imagination. I also love picking raspberries! Our raised bed garden hosts ever-bearing raspberries which everyone enjoys. We also have a very old fig tree, and late summer figs taste like ambrosia. We love to pick summer cherry tomatoes, and just pop them into our mouths! We oven-roast them as well— and they are so good with salads or artisan breads. We save seeds from heirloom types to grow the next season. Cooking together is the ultimate bonding activity. Food is love. What types of foods do you love to cook when it comes fresh from the urban farm? Wilma: Cooking with or a creating a meal with just-picked anything is full of flavor. I love fresh herbs- flat- leaf parsley, cilantro, Italian and Thai basil, rosemary, thyme and oregano. Some favorites that come to mind—No cook summer rolls with peanut sauce! Watermelon, arugula, mint & feta salad. Rhubarb galette with cardamom. Silver Palate’s Summer pasta with brie, tomatoes, basil & garlic. Greek meatballs with lemon zest, parsley and oregano. 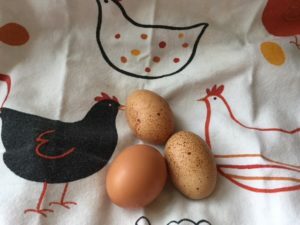 Weekend omelettes- Liane is comfortable with the girls at Cluckingham Palace— and enjoys collecting the eggs! Kale and brussel sprout chips. Liane: My mom loves to make rhubarb tarts, and we’ve made chard salads and other stuff in the past. Her favorite fresh-from-the-farm thing is eggs. 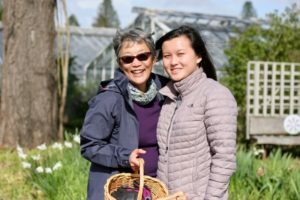 What have you learned about gardening from your mom? Liane: When it comes to gardening you need to be gentle with the roots and dig a deep enough hole, so the roots don’t get squished. Also don’t crowd an area with too many plants or seedlings because they grow out and sometimes the stronger plant takes too many nutrients from the weaker one. Wilma: Worm and worm bins are amazing. Worm castings are nature’s best nitrogen-rich fertilizer. Becoming a master gardener has been on my list for a long time. I got a lot of practice when two women and I re-created an elementary school garden, after school garden club and read n’ weed recess for children who needed a quiet retreat. Looking forward to sharing food, nature and fun with my new community! Watering plants in the greenhouses. Residents can have indoor and outdoor gardening plots. Let’s just say that the brilliant knowledge of food and fun have already begun! We are looking forward to more sharing and joyful moments in the agrihood!